Tiny bees, missing butterflies, and ‘mysterious’ human illnesses in our neighborhood are warnings in this time of great ecological distress. As we prepare for spring after a long and hard winter, we remember scientist Rachel Carson’s image of the ‘Silent Spring’ and her seminal writings that began a worldwide movement toward the care of our planet. Carson believed that human care of the world grew from one’s sense of wonder and love. In this 40th anniversary year, we prepare for the next 40 years by bidding all to enter into this world with senses — sight, hearing smell, touch, taste — open. Come build personal relationships with all our kin who crawl, walk, fly, swim, grow up from the ground, swirl above us, and flow in our veins. May the power of our coming together bring exuberant love for the health, joy and justice of the world. 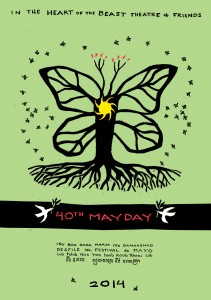 The parade begins with two celebrations – 40 youth from phillips walking tall for 40 years of MayDay! And three cheers for the 80th Anniversary of the Truckers’ Strike that made Minneapolis a Union Town. Silenced Spring envisions the folly of the consistent human tendency to control the natural world and to measure its worth as an extraction of profit. Extolling “Better Living through Chemistry,” characters in Comedia de “Chemedia” masks administer toxic medicine to the Tree of Life. Like comedic Dr. Frankensteins, the inject fluoride, benzene, radiation, plastics, pesticides and herbicides in an effort to make life better and more profitable. The Tree of Life becomes weaker as the “doctors” extract its blood into large IV bags of oil. A Silent Death hovers, carrying oil trains. Where flowers once grew, oil derricks bloom, and drones are the new birds. Security pawns “protect” this scene. Its body of water is so infused with waste that nothing can live. Silent attendants carry a rippling shroud, the silenced birds emerge from its wake. In the words of Zen teacher John Tarrant, “Attention is the most basic form of love.” Seven huge ears move solemnly down the street, asking us to Listen! Pay Attention! and Wonder. The ears are bent to the ground. They stretch outward to catch the slight buzz. The ears move through humans cradling dying bees and birds, hearing the mourning of all the humans. If we “listen into” the Silenced Spring, what might we discover? Open your perception with all of your senses — your eyes, ears, hands, heart and mind. The tiny bees are telling us that something is amiss. Their illness is an indication of a much bigger problem. Communities of Light co-op member, Raymond Jackson, rose at the firs MayDay brainstorming meeting saying, “What do we want? – SOLAR POWER! What do we need? – SOLAR POWER?” Was he saying “soul” or “solar”? That led to a wonderful joyful thinning about “SOUL-AR POWER,” a combination of sun energy with heart energy. Then came the idea of a SOUL TRAIN! This train features the solar lantern and community weaving work of Communities of Light, and ushers in the turning of heart energy and action toward the health of all, just as the great wheel of the sun turns our days into years. Ah! The amazing bees! The sun shines and flowers grow. Pollen appears as tiny suns in the flowers. The bees visit the flowers, wiggling and jiggling in their important work of pollination. Because of the bees, the flowers produce fruit for us to eat. The bees cary nectar back to the hive, and through their ardent organizational abilities, voilá! – they produce sweet honey! Please plant flowers for the bees that are ‘clean’ – that are not treated with chemicals that impair the health of the bees or pollinators. A list of flowers good for pollinators: Clovers! Dandelions! Cone Flowers! Black-eyed Susans! Bee Balm! Wild Roses! If you averaged the size of all the animals on the planet, the result would be a creature the size of a fly. There are so many intricate relationships in the natural world that exist on a scale smaller than a mouse’s body. In fact, to see most of the animal interactions on the planet, you need a magnifying glass or a microscope. We chose to magnify some of the most lovable and fascinating of these: moss and the microscopic creatures that dwell in the moist mossy microclimate; the amazing pitcher plant; lichen; flowers and the beetles, dragonflies and other insects that live inside them; and peonies, which produce a sweet sap that ants love. The Wonder Shuffle is all about large things: connection and awe, the vibrancy of nature, and unlocking our souls to experience the world. The term “shuffle” refers to a dance in which two lines form a corridor for partners to dance down. Each time through the line partners change – allowing many different dancers to connect. In this section a variety of animals shift partnerships down the street together. Inspired by the hit show Soul Train, they are dressed in the height of 1970s fashion. Keystone animals, such as the wolf, hold golden keys, symbols of the vitality of their existence to strengthen and balance our ecosystem. Wonder boxes stroll down the street, enticing curious bystanders to use the keys to unlock their magic. Much like the progressive nature of the shuffle, a large number of creatures mix and mingle in this section. What does it mean to be arrested by wonder? We have all, at one time or another, been seekers. Sometimes on our journey we miss the most obvious signposts. Something wondrous happens before our eyes and we just can’t see it. When wonder touches our hearts, however, it demands our full attention. Each year thousands of monarch butterflies travel more than 3,000 miles to the south, to Mexico and Southern California to doze until their return to the north the following summer. This is arresting. Each year hundreds of human migrants die making a similar southern crossing trying to cross the border between the United States and Mexico. The powerful monarch butterfly has been adopted as a symbol by many immigrants’ rights groups. Thank You Lake, Critters, Fields, Flowers! Forty Years of Wonder?! Welcome! Beeeutiful Union Makes Us Strong! And now – Tiny Wonders! The Tree of Life, Gift for us All!